My Count Chocula Monster Chow starts off with Count Chocula cereal, coated in chocolate, and is then mixed with even more chocolate. In case you weren't convinced, it certainly will satisfy any chocolate cravings, but I guarantee that you won't stop munching on it! Sink your fangs into my Count Chocula Monster Chow, full of chocolate, chocolate, and more chocolate! Chocaholics be warned: you will have a love-hate relationship with my Count Chocula Monster Chow. It starts off with Count Chocula cereal, coated in chocolatey-goodness, and is then mixed with even more chocolate. In case you weren’t convinced, it certainly will satisfy any chocolate craving you may be having, but I guarantee that you won’t stop munching on it! Just in case you missed my previous posts, I was given the opportunity by General Mills to make some recipes using their Monster Cereals, including the newly-resurrected Fruit Brute and Yummy Mummy! I previously posted a super yummy recipe for my Frankenberry Monster Chow! 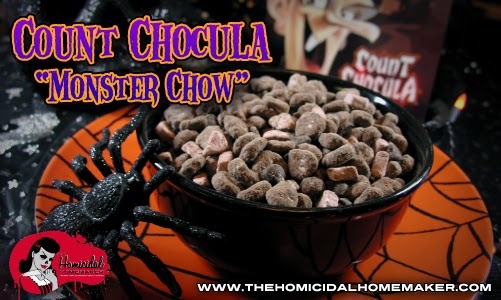 Whether you’re familiar with Chex snack mix as ‘Puppy Chow’ or ‘Muddy Buddies’, this Count Chocula Monster Chow is the same concept…except The Homicidal Homemaker uses the oh-so-delicious chocolatey-ness of Count Chocula cereal! Like my recipes for my Yummy Mummy Fudge, Count Chocula Chip Cookies, and my Frankenberry Monster Chow, this Count Chocula Monster Chow is a snap to put together, and is super easy! And extremely chocolatey and addictive. But best off all, it’s super affordable to put together! Remove marshmallows from cereal, and set aside. Pour the cereal pieces into a large Ziplock bag. Measure out 1/2 Cup of chocolate chips, and add a few more chocolate chips on top to get approximately 5oz. Melt the chocolate chips in a microwave-safe bowl, in 30-second increments, stirring in between, until the chocolate is melted and smooth. Pour into the Ziplock bag, over cereal pieces. Seal bag, and shake to evenly coat the cereal pieces. Add powdered sugar and cocoa powder to the Ziplock bag; seal and shake to evenly coat the cereal pieces. After they are fully coated, add reserved marshmallows and extra chocolate chips to the mix. Show your fangs (or put in your plastic ones! ), pour into serving bowl, and dig your claws in and enjoy! Previous articleQuick & Easy 5-Ingredient Count Chocula Chip Cookies!